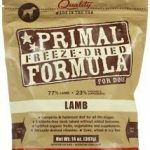 Primal dog food is a different type of food for your dog. Their food is raw, based on the premise that the primal instinct of animals is to eat raw food. They believe that raw food mimics the food found in nature, and that the best food for your pet is what they would find in the wild. As you can imagine, premium raw food can be on the expensive side, but Primal dog food coupons can offset the cost. The company is relatively new, only beginning in 2001, but they are making a big impact on the pet food industry. They use human grade ingredients from USDA farms to make their products. The products also do not contain any grains or gluten, which is used in many pet foods as a filler. Online Primal coupons can help you buy the products at a reduced cost, and it’s even easier for you to save when they’re printable.